This School in Delhi, India, was built in a slum, mostly by volunteers. Shagun believed in the efficient use of natural resources, like mud, over common alternatives like cement. She says, “In the earthbag technique, the advantage is that 95 percent of the soil can be used as it is, without any alteration. That can’t happen with any other building style." This school for orphans, called "Ark Soaring in the Sky, "is in Sangkhlaburi village, Thailand, located near the borderline between Thailand and Myanmar. In this area there are a lot of poor people who immigrated from Myanmar. We designed the school with two architectural components: one is the earthbag building and the other is a light steel building with bamboo and grass roof. The earthbag building is set on ground floor and the steel building is for the upper floor. This is a Shinto Shrine for remembering our origin. It was designed for the "Water and Land Art Festival" held in Niigata City. This shrine exists in a vacant lot between two bridges. At this site there used to be lots of houses where many people lived. But after construction of the bridges, the town and people disappeared. In this shrine we can be lost in meditaion within the calm space of the main hall. The Free Burma Rangers Clinic in Thailand features a unique "HyPar" roof. The basic process for this type of roof involves building a wood or bamboo frame, stretching nylon plaster mesh over the frame and stapling in place, and then coating the roof on both sides with a slurry of Portland cement and latex/acrylic admix. The end product will be weather tight, well vented, resist jungle rodents, cool to work, low cost and can be erected simply and quickly. We are building a Health Clinic in a poor peasant rural community in Chiapas. We have spent about $2300 US for a three room, 50 square meter useful area of construction, not including labor. I have the goal to create an initiative to address the need for affordable housing in Chiapas. Other details about this project can also be seen: Window and Door Forms and Laying the Bags Down. This Earthbag Clinic in the Philippines was coordinated by Illac Diaz, the young Phillipine visionary who has spearheaded many such earthbag projects in the area, including several schools. There is no text describing the process of building, but the many photos tell most of the story. You will notice that the bag material was removed after the fill had set up and before the building was plastered. The Next Aid Child Support Center in South Africa as described by Joe Kennedy. "This center will eventually incorporate an orphan/elder ecovillage, performance and study spaces, a micro-enterprise element and sustainable food production systems. It is our hope that this center can be the first of many to serve the over 27 million orphans of the HIV/AIDS crisis in Africa." This Honduras Orphanage project describes the construction of a 2400 sq ft earthbag bulding with three large interior bedrooms, two bathrooms, a kitchen and a utility room. It has 9 doors and 14 windows. A crew of about 20 were able to get the walls up to roof level within about 10 days. The 750 sq. ft BLM Ranger Station located at the Sand Island Boat Launch along the San Juan River in Bluff, UT. The 9.5 foot tall earthbag walls took 570 man-hours to build. The earthbag walls were completed in 8 days with a crew of 5-9 people. Kaleidoscope is a structure meant for arts, crafts and music for children, built at the Aman Setu school campus at Wagholi, India. The Kaleidoscope was designed to keep the embodied energy low; all materials were procured from the same locality with a conscious effort to reuse discarded material. The earthbags are discarded cement sacks, the infill material consists of earth dumped at adjacent construction sites, the stone and grit were bought from a neighbouring quarry. 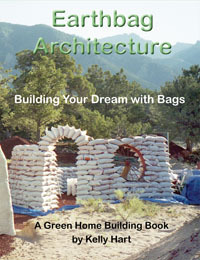 Discarded pieces of PVC pipes were used to create openings in the earthbag walls. The roofing system is designed entirely in bamboo, with a covering of used billboard material.